Editor’s note: This is the second installment in a series of dispatches from the Rath family (Colin & Pam, daughters Breana, Meriel and Nerina, dog Aspen and cat Wasabi), who departed Stamford, CT last fall for a worldwide cruise aboard their Hanse 545 Persevere. 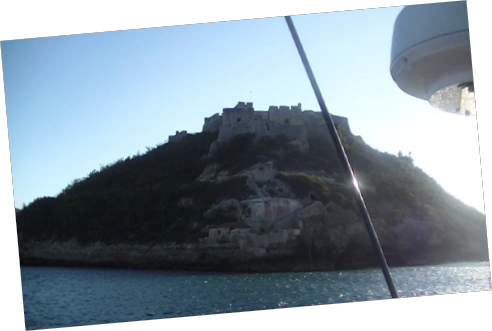 Little did we know when we rounded the Spanish castle Fortaleza de San Pedro Del Roca Del Morro at the coast of Santiago de Cuba what had transpired that day. It was 8 am on December 17, and we had just sailed from the Bahamas and had intentionally been out of the news loop for a while…one of the main points of cruising, right? We were quickly brought up to speed when the Cuban health inspector boarded Persevere. Like the rest of the world, Cuba initiated a superficial Ebola inspection for arriving vessels before we would be allowed to dock for the other five departments’ inspections. We were prepared for this from research that told us checking in can take a full day or two. Dr. Luis asked if we had a thermometer. Pam acknowledged that we did, and was asked to take all our family’s temperatures. It was hot, so we offered him a glass of water while Pam was doing her new nursing duties. Dr. Luis refused, but suggested he would gladly accept a cerveza on this day of celebration. With Heinekens at 9 am, Dr. Luis proceeded to tell me how he would be interested in going into business with us to promote tourism on the web. How there is no information for people coming to Cuba on where to go and what to see? He was excited about the possibilities on the future relations with America since President Obama announced he was opening relations with Cuba again that morning. Dr. Luis invited us to dinner at his home to discuss it further. This turned out to be a familiar conservation. All of Cuba saw foreign visitors as Internet information ports and were eager to capitalize on any new relation to the outside world. After copying several documents on our on-board printer for the doctor for his future inspections (good copies are expensive ashore, we all know how expensive toner is, think how expensive it would be in a closed country). Upon his exit, Dr. Luis thanked us on the quality of the copies and asked for a couple Heinekens for his wife. He put the beer in his briefcase and we were allowed to proceed to the marina for docking thanks to Nurse Pamela’s accurate temperature readings. Further inspections in port lasted the rest of the day and continued the next morning with the vet checking our dog Aspen and cat Wasabi. The Cubans say that they learned bureaucracy from the Russians, and they were good students. Now, a point of clarification. We did not know that you are allowed to bring pets into Cuba with the correct documentation, but they are not allowed to leave the marina that your boat is in and the authorities prefer that the animals stay on the boat. This was news to us because we had done research and nothing about that restriction was mentioned, but it was prudent because Cuba is littered with wild packs of disease-ridden dogs. The last thing a visitor wants is to be walking a dog down the local streets and have a pack of wild dogs show up. The marina was pleasant, with restaurant and bar and conventional with cement docks. Tap water was only for washing the boat – drink only bottled water in Cuba! Once we were organized, we proceeded to explore the city. I am sure you have heard all about the 1950s American cars with fins still on Cuban roads, and they are. But, you have to realize that they have literally been on the road since the ‘50s without any manufacturers’ parts or dealer service. These cars are held together with handmade parts and jury-rigged repairs, and many are barely drivable. None of the speedometers work or any of the gauges, for that matter, and most of their shocks went in the ‘70s. The fact that these cars are still on the road may be a testament to American manufacturing quality in the ‘50s, when products were built to last. Unlike nowadays where products are manufactured to only last until the next version comes out in six months. Still, the tailfins are cool. On one of our taxi rides to Santiago de Cuba, while coasting down a hill (all Cuban taxi drivers do this to save fuel) our driver saw something, stopped abruptly and backed up. We were looking out the window for some animal or plant or something else we thought he wanted to show us…crazy Americans. He got out of our cab, a 1950 Lada (a small Russian FIAT), walked down the dirt road a few feet and picked up a lug nut, opened his trunk, grabbed a tire iron and put the nut on his rear wheel. Upon his return, he told us that he was down to three lugs on that wheel and needed to find that one he lost last week to keep the wheel on. We decided to stop asking questions about the cars after that or we probably would not have gotten in them again. The Cuban government also provides much newer taxis that are safer and have air conditioning, but fares are twice as expensive…and you want to see the real Cuba, right? Plus most government cabs are minivans or SUVs, and the driver usually brings his family on longer fares. The driver took his wife and child along for the ride when we took a visit to El Salton in Sierra Maestra, about two hours away in the mountains where Castro began his rebellion. We didn’t want to break down in the hills with an old American car, and decided the expense was worth the air conditioning and shocks for a more comfortable long ride. El Salton, Cuba’s highest waterfall, plunges into a large swimming hole in a dense jungle. 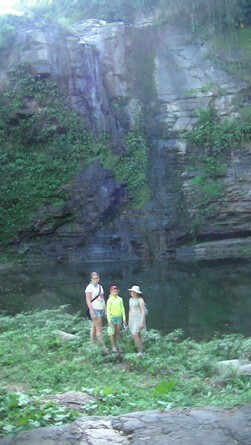 It was beautiful and relaxing, and the kids enjoyed a swim in fresh water for a change. There was a nice resort nearby that served a quiet lunch surrounded by beautiful natural jungle and flowers. To learn more about the people of Cuba, we befriended a young man named Oscar Mendez, who was on winter break from college where he was learning English. Osacr became our guide and jack-of-all-trades during our visit. He knew where to change money on the black market (local DVD pirates were the “bank,” give an 8% better rate), where to get the best cigars (a box of 28 Cohebas in a sealed box for $60) and fresh fish. He taught my daughters how to salsa and brought us to local salsa clubs (actually people’s houses where they have bands play and sell drinks) and private homes for meals, to name a few. He also helped set up a trip to Parque de Baconao, an 800-square kilometer park in which a complete Jurassic Park is brought to life in actual-size cement sculptures. Baconao was built in the 1970s by political prisoners. My kids thought it was better than Disney World. We teamed up with two other cruising families in the marina (one French and one Austrian family we met along the way that had children) and rented a truck to drive us to Baconao with a stop on the coast for a swim and lunch. 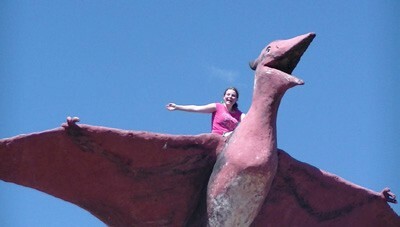 Everyone loved climbing on top of the dinosaurs with many photo opportunities and enjoyed a good swim on a beautiful beach. We had lunch right on the beach, with fresh fish, shrimp, octopus, beer, fresh fruit, plantains and live local music. It was fortunate that we brought such a large group, since the truck had lost its starter decades ago. We were the “starter,” and it took all 10 of us to push start this large truck after each stop. It was a large yellow truck with metal benches along the sides and handholds on the ceiling of a type that is used for busses in Cuba. It got us there, but comfort was not one of its benefits. 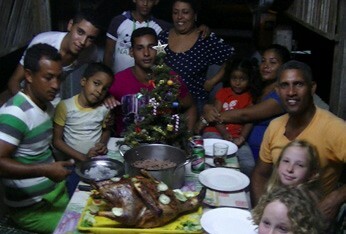 embraced our new extended family and spent most of our days touring with Oscar’s family and had several meals at his home, including Christmas dinner. They went out and got a turkey; they had never had one and wanted to celebrate an American Christmas dinner. It was nice meal, much rum was had, and there was much dancing and celebration. We exchanged addresses and will keep in touch with our Cuban family. Cruising rule #2: Go all in native when visiting a new country. Forget any perceptions about the location and learn what the real people feel about their country and yours, and try everything. Don’t hesitate. Use common sense, of course, but let your inner child out and view the place as a new world. My family had a real non-commercialized Christmas for once and met people with very little who were willing to share all they had with us to explore new relationships. We still did the traditional present giving, but we expanded it to our new Cuban family and got back much more than material gifts. My daughter Breana learned to be a good Salsa dancer (you can see her on our Facebook page, Persevere60545), and made a good friend with Oscar’s daughter Daniella. I learned how to dive for squid and de-ink them for cooking. My family went to local markets and saw how people in other countries sell meat, vegetables and produce 9cement stalls and no refrigeration), which made our children realize how lucky they are. Life during our voyage has become about new experiences and touching people again, as life should be. I know this is what my family wants to be doing more of, and think the world might be a better place if more people put down their phones and actually conversed with each other. In addition to family cruising, Persevere has a very ambitious racing schedule. After a season in the Caribbean that includes the St. Maarten Heineken Regatta in March, the Raths are returning to Newport, RI in June. Their 2015 racing calendar (with additional crew) includes the NYYC RORC Transatlantic Race in July, the Rolex Fastnet Race in August, the Rolex Middle Sea Race in October, and the RORC Transatlantic Race (Lanzarote, Canary Islands to Grenada, West Indies) in November. Look for updates on Persevere’s journey in future issues of WindCheck.